Supporting their earlier 2013 release, Thy Kingdom Scum (review here), Japan’s resident serial-killer-obsessed lords of Sabbathian stonerized doom madness Church of Misery will return to US shores next month. They’ll arrive fresh off a stint in Australia that ends on Oct. 6 and includes a performance at the Doomsday Festival in Sydney. Joining them for the North American run will be a rotating cast of characters including Saviours, Wizard Rifle, The Gates of Slumber and Against the Grain. The first two will cover the West Coast portion of the tour and the latter will pick up in the Midwest and carry on east before Church of Misery head back west to finish out in Arizona and Los Angeles, as if just to make sure they’ve utterly destroyed the appropriate amount of major urban centers before leaving. No doubt they will. 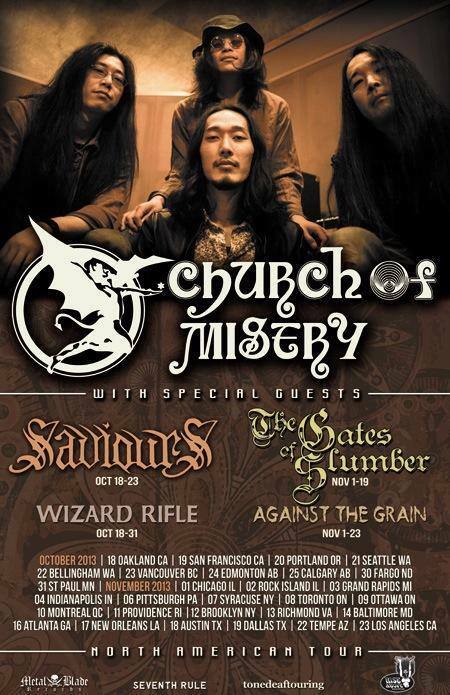 Church of Misery returns to the U.S.! 02 Rock Island IL @ Rock Island Brewing Co.
Terror in Tokyo is Church Of Misery’s 4th dvd and first to ever be available outside of Europe or Japan and 1st since since 2007’s Live In Red – Eurotour 2005. Along with the main feature the entire set from the 2012 Maryland Death Fest has been added as bonus material. 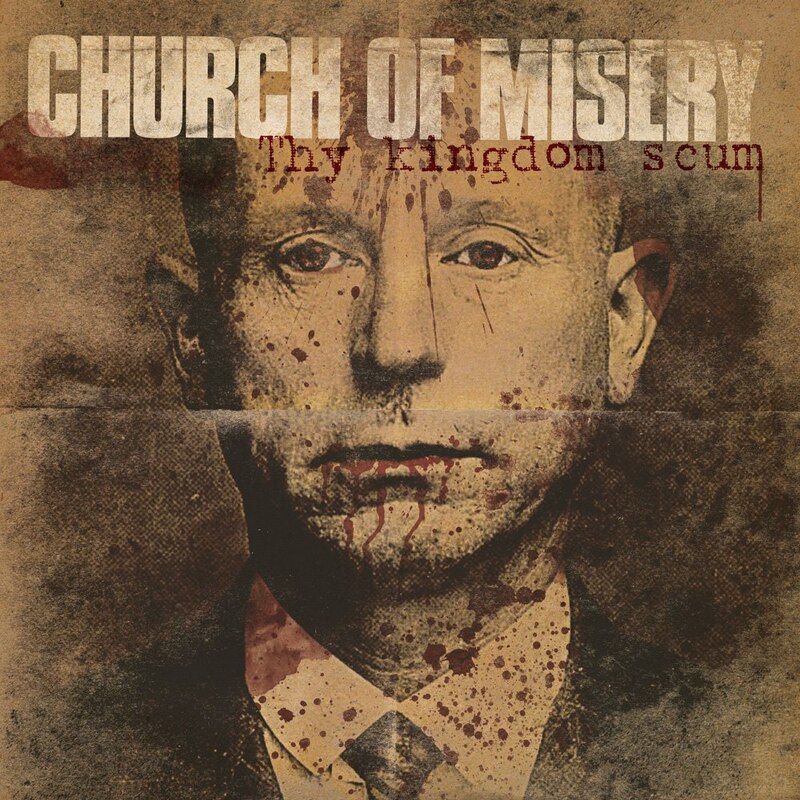 In some ways, it makes sense to think of the new Church of Misery album, Thy Kingdom Scum (Rise Above/Metal Blade), as a sequel to Houses of the Unholy. Like that 2009 full-length (review here), the title is a pun with a religious theme also based on a classic album — the Japanese outfit had a song “Kingdom Scum” on their first album, Vol. 1, that finally got released in 2007 with an Emetic Records reissue in 2011 (review here) and was a take on Sir Lord Baltimore‘s 1970 debut, Kingdom Come . Both Houses of the Unholy and Thy Kingdom Scum also have seven tracks with one cover from the canon of classic heavy — on the 2009 album, it happened to be “Master Heartache” from the aforementioned Sir Lord Baltimore LP, and on Thy Kingdom Scum, it’s the bluesy “One Blind Mice,” a single from Quatermass that’s been included on reissues of their 1970 self-titled debut. Both covers are even placed the same, as the fifth of the total seven tracks — track five is also a cover on 2001’s Masters of Brutality and 2004’s The Second Coming. And of course the band’s long-running adherence to serial killer-worship and raw, Sabbath-derived heavy doom rock remains at the core of what they do. 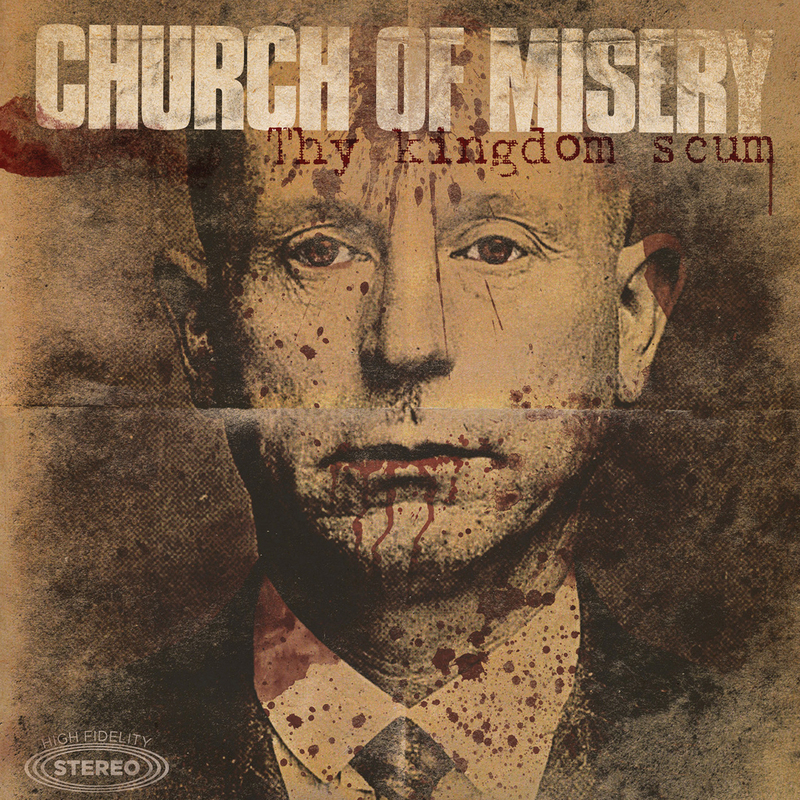 Like no one else on the planet, Church of Misery are able to make familiar riffs sound new again, and Thy Kingdom Scum continues that tradition. True to its predecessor and everything the band has done up to this point, these songs offer unhinged bombast propelled by druggy grooves that reflect the madness and psychopathy their lyrics convey. As ever, each song is about a serial killer. As ever, bassist Tatsu Mikami resides at the center of the songwriting. As ever, they are among the best in the world at what they do. Thy Kingdom Scum shares a number of similarities on a number of levels with Church of Misery‘s last effort — which along with sundry fest appearances throughout Europe and the US and extensive touring in both territories, helped establish them as one of the heavy underground’s most potent acts — but even more pivotal to its ultimate success are the differences between the two. The methodology behind their craft is largely the same, Mikami feels no apparent need to deviate and at this point, Church of Misery have turned their obsessions into their aesthetic, but the personnel involved is different. 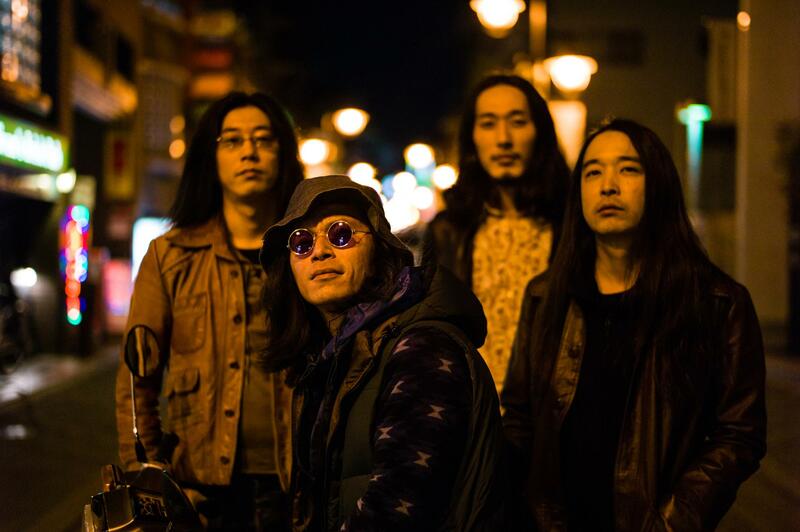 Guitarist Ikuma Kawabe has come aboard as a first-timer, and vocalist Hideki Fukasawa returns from Houses of the Unholy, but has been in and out of the band along the way, while Mikami — appropriate enough for the bassist — is the anchor as the only remaining founding member and drummer Junji Narita marks the 13th year of his tenure. Mikami‘s songwriting is also more hammered out on Thy Kingdom Scum, and some of the elements that made cuts last time around like “Shotgun Boogie (James Oliver Huberty),” “Blood Sucking Freak (Richard Trenton Chase)” and “Born to Raise Hell (Richard Speck)” so memorable find further development and realization within “Lambs to the Slaughter (Ian Brady/Myra Hindley),” “Bother Bishop (Gary Heidnik)” and “Düsseldorf Monster (Peter Kürten),” as well as the mostly instrumental opener “B.T.K. (Dennis Rader),” which makes an immediate chorus of its riff and relies on samples to carry across vocal ideas. Not an unfamiliar tactic either for Church of Misery. While the penchant for gruesomeness has only seemed to add to the band’s charm over the years, they’ve had to get fairly obscure in their source material. Easy enough to look up who Dannis Andrew Nilsen is (the British Jeffrey Dahmer) and what he did (killed people and ate them, duh), but I have to wonder at what point Church of Misery might just decide to go back to some of the mainstays of serial killerdom and shift their approach somewhat. They started out with the likes of John Wayne Gacy and Ed Kemper on 2001’s Master of Brutality, and to go from that to John Linley Frazier and Peter Kürten begs the question why they couldn’t just write a second song about Charles Manson. Hell, there’s an entire album’s worth of material there. Why not do a whole record about the Manson Family, or Ted Bundy? Some killers, with countless books written about them and studies done, are legends worthy of another look. I’m certainly not going to complain about the surprisingly strong hook to which “Brother Bishop (Gary Heidnik)” arrives when Fukasawa guts out the line, “We shall make a new world!” or Mikami‘s ultra-righteous Geezer Butler-ing in the same song, and I guess there’s an endless supply of killers to choose from — and at this point it seems unrealistic to ask Church of Misery to write a song about anything else — I just wonder at the need to spread the theme so thin. Would anyone get mad if Church of Misery did another song about Aileen Wuornos? Yeah, everybody thinks they’re the biggest Black Sabbath fan in the world, but long-running Japanese doomers Church of Misery have a pretty solid case working in their favor. Like, you know, everything they’ve ever done. Led by bassist/founder Tatsu Mikami, the Tokyo-based four-piece will issue their fifth full-length, Thy Kingdom Scum, on Rise Above in Europe and Metal Blade in North America, May 27 and June 11, respectively.